'AIRPLANE!! AIRPLANE!! AIRPLANE!!' [points to sky and does a little happy dance]. Oh the simple joys of an almost 2 year old. This kid gets more excited for airplanes than he does for cookies. (Though to be fair, he has been on an airplane many more times than he has had a cookie.) 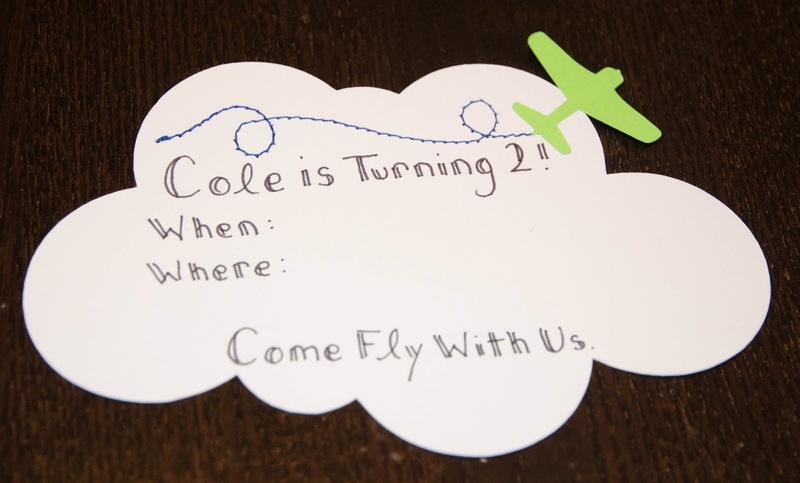 And that is how we arrived at an airplane themed second birthday party. I'm looking forward to having a theme I know he'll enjoy:). I've only done the invitations so far, but I'm having fun and it gave me an excuse to try something I've always wanted to do...sew paper! 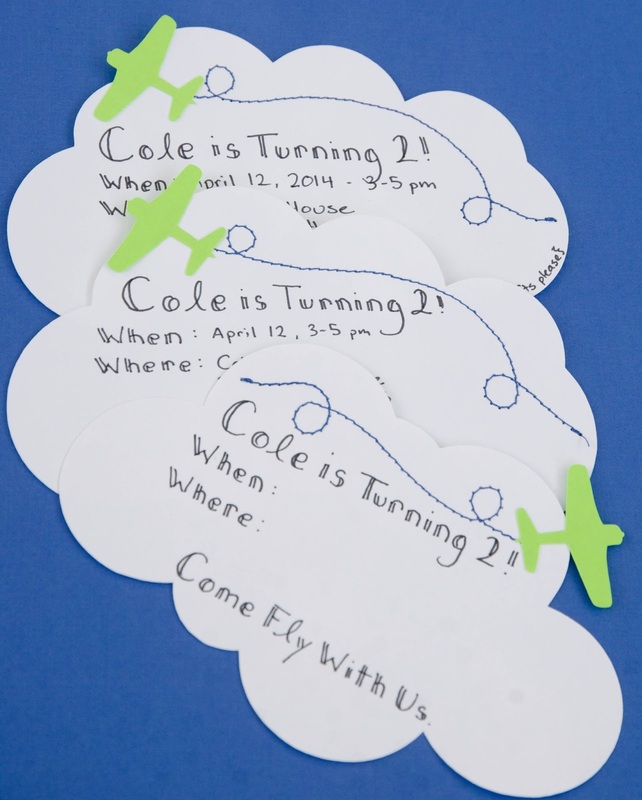 These invites were surprisingly simple to put together. Again, I put my Silhouette Cameo to good use cutting the clouds and the airplanes. The designs used were '9 clouds' and 'wwii airplane'. After cutting the clouds and airplanes, I stitched a blue airplane 'trail' along the top of the cloud, backstitching one stitch at each end. Snip the ends of the thread close to the invitation and add a dab of glue on the back to stabilize the thread if desired. Next, I added the text. And can I just say, for a lady who has horrible handwriting I think it actually turned out ok! I used some whimsical lettering that would be a bit forgiving with mistakes. And I highly recommend the Sharpie Pen . The finishing touch was adhering the green airplanes with craft glue. 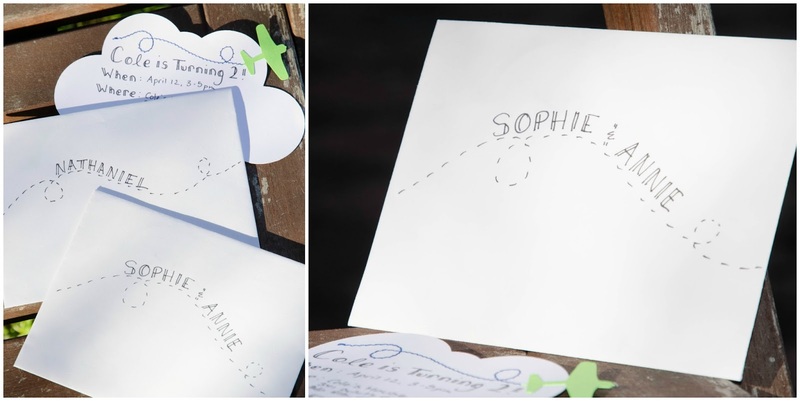 For matching envelopes, I hand drew another airplane trail and used the same lettering for the names. In hindsight I think using blue and green ink would have been even more adorable. Hopefully the rest of the decorations turn out just as cute. Guess I better get started! 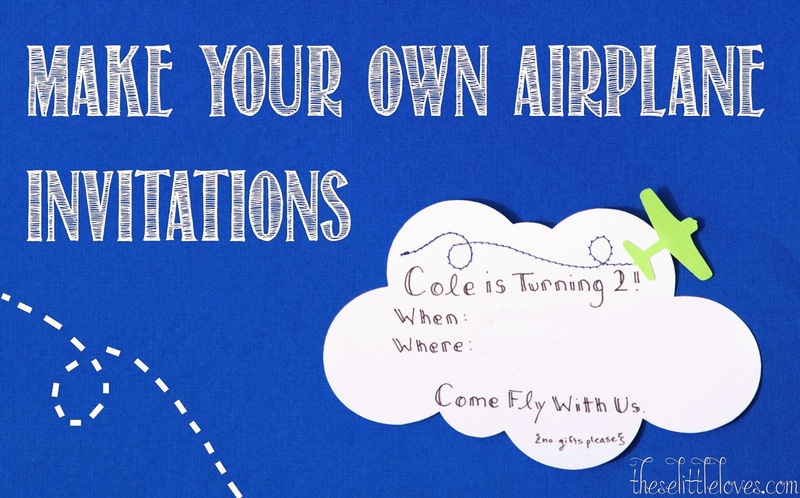 Want to see the full airplane party that matched these invitations? Go here.